I love sweet potatoes and I eat them a lot. I just love the caramel sweetness of them. I eat them dipped into hummus, with roasted veg, salad bowls, or just on their own. They make the perfect snack or side dish to a main meal. These are really easy to prepare and you can make the sweet, savoury or how I like them most – a little of both. 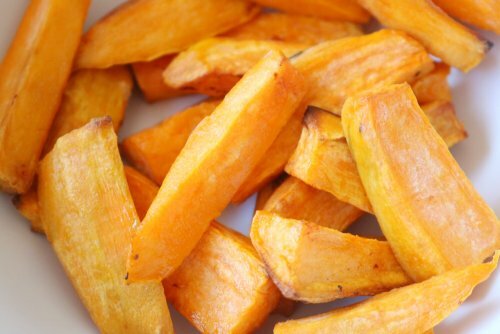 The lovely orange colour in the sweet potato comes from the beta carotene and Vitamin and A and they’re a great source of antioxidants and plant based carbohydrates.